Kanye West owes about 250 hours of community service after attacking a photographer at L.A.X. last year during what was an unfortunate string of run-ins with paparazzi, and he’s been granted the opportunity to serve those hours out pretty much doing what he does best: preaching about his life to people who have no clue what he’s talking about. Los Angeles Trade Technical College students were in for a pretty crazy surprise when they were asked to show up after their day of classes ended to help other students with their work, and they ended up at Professor Kanye West’s mercy. 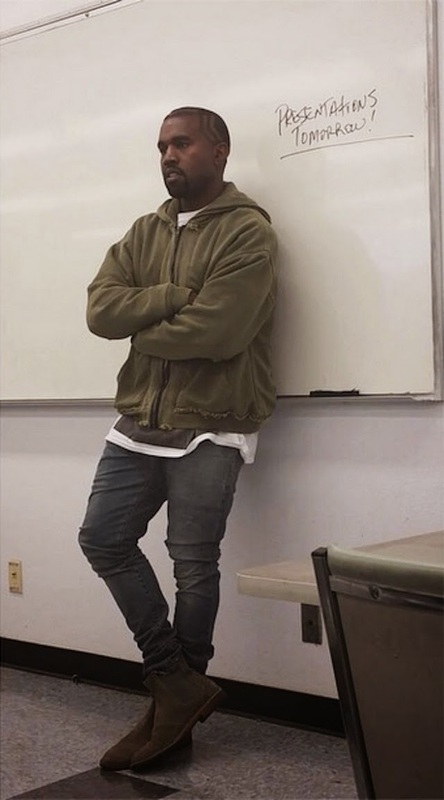 For about 2 hours, according to one student–as told to Complex–West ranted about the fashion industry, and his struggles with getting people that align with his music vision to see the visions he has for his fashion endeavors, and several other topics–the kind of topics only Yeezy could talk about for hours on end. A lot of stuff. He was all over the place, but I mean, one of the main things he was talking about was…he was giving examples of different things and saying that having a Rolex or a Benz is not something that actually represents your success because there’s always something more expensive to buy. So, he was saying that success was really being able to do things for others as well as the people around you and yourself. Who taught you? Wait, don’t answer that.